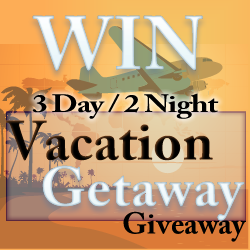 3 Day / 2 Night Vacation Getaway Giveaway! For many of us we look forward to getting away and taking time to recharge but often times can't afford it so it doesn't happen!! We are here to help you "getaway" from it all! Shopper’s Haul is sponsoring a 3 Day / 2 Night Vacation Getaway and has teamed up with other awesome bloggers to give one lucky reader and a guest their choice of a 3 Day / 2 Night Vacation Getaway to one of 22 Destinations. To be entered in this giveaway you must follow the instructions outlined on the Rafflecopter Form! All entries will be verified. This giveaway will run from January 15 - February 15!! The vacation giveaway certificate is redeemable for a reservation form, which provides the winner and a guest, hotel accommodations in your choice of the cities above. Shopper’s Haul, LLC will reimburse the winner for the processing, postage and handling fee of $15.00 after it has been paid by the winner (proof of payment is needed). The winner will need to cover and pay for the hotel taxes of $7.00-$15.00 per night, depending on the city selected. The room tax is due when you send in the reservation form you will receive in the mail to book your room. No other purchase is necessary. This offer is not connected with a timeshare presentation or sales pitch. Reservations must be taken within one year and need to be booked at least 60 days in advance. You must be 21 or older to use the certificate. Dates near holidays, weekends and during conventions are usually not available for use with this certificate. Transportation, meals and room taxes are not included. This certificate is not valid for conventions or any group travel. Only one certificate may be used per family, per city in any 12 month period. This information will be on the reservation form when you receive it. Didn't see a place to leave twitter handle for verification: mine is megananne73, hope that doesn't disqualify me! I am promising myself that if i win this well deserved vacation it will be my first i will visit my Friends grave sight also for the first time and visit her baby & let her baby know how much she really meant to me & what a great mother & friend she was. Thanks for this great giveaway.I hope i win me and the man of my life need a good vacation.Since we had are to wonderful boys.We don't get to spend much time together.Plus he works alot.But if i win i would love to go to Orlando, FL.I never been there. That looked like a fantastic giveaway, congratulations to whomever got it. I hope they'll be a repeat of this contest for the next holiday season.